INDIANAPOLIS, IN – Indiana Vein Specialists (IVS), a medical practice specializing in comprehensive, office-based and minimally invasive care of varicose and spider veins, has been granted a three-year term of accreditation in Vascular Testing in the areas of Peripheral Venous Testing by the Intersocietal Accreditation Commission (IAC). The accreditation, which applies to both the Fishers and West Carmel offices of IVS, means that the practice has undergone a thorough review of its operational and technical components by a panel of experts. The IAC grants accreditation only to those facilities that are found to be providing quality patient care, in compliance with national standards through a comprehensive application process including detailed case review study. IAC accreditation is widely respected within the medical community, as illustrated by the support of the national medical societies related to Vascular Testing, which include physicians, technologists and sonographers. Many factors contribute to an accurate diagnosis based on Vascular Testing. The skill of the technologist performing the examination, the type of equipment used, the background and knowledge of the interpreting physician and quality assurance measures are critical to quality patient testing. IAC accreditation is a “seal of approval” that patients can rely on as an indication that the facility has been carefully critiqued on all aspects of its operations considered relevant by medical experts in the field of Vascular Testing. When scheduled for a Vascular Testing procedure, patients are encouraged to inquire as to the accreditation status of the facility where their examination will be performed and can learn more by visiting www.intersocietal.org/vascular/main/patients.htm. For more information go to www.indyveins.com or call 317-348-2020. Indiana Vein Specialists is led by owner and chief medical officer Jeffery P. Schoonover, M.D. Dr. Schoonover is a board-certified phlebologist specializing in venous and lymphatic medicine. He and his team provide comprehensive, office-based and minimally invasive care of venous insufficiency. Treatments include Endovenous Laser Ablation, Ultrasound Guided Sclerotherapy, Surface Sclerotherapy and Microphlebectomy. 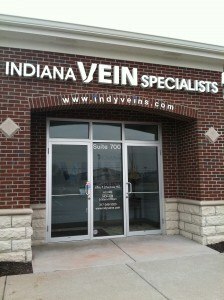 Indiana Vein Specialists has two locations: 118th & Olio Road in Fishers and 106th & Michigan Road in Carmel.